Google Earth Blog Exclusive: The new Globe Glider has finally been released. Globe Glider first came out over a year ago and allowed you to tie a Google Map to Google Earth in an integrated fashion. The new Globe Glider goes much further than last year's version. Now, not only can you tie together maps, but you can tie together Virtual Earth to Google Maps - OR, you can tie together Virtual Earth to Google Earth! I'm going to have to make a video (UPDATE: see the video here) to truly demonstrate how amazing this works (or you can try it yourself). 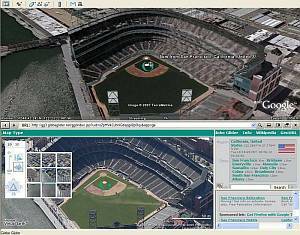 You can even compare a Google Earth scene with a 3D model to a Birds Eye view in Virtual Earth of the same thing. Not only that, but I discovered you can even run the Virtual Earth 3D version within the built-in Google Earth browser and directly compare a scene in VE3D to Google Earth. The neat thing is that if you change the view in one window, Globe Glider changes the view in the other window to match. In the screenshot above, I'm looking at the baseball stadium in San Francisco in Google Earth in the top part of the screen (with a 3D model of the stadium) and a Bird's Eye view of the same stadium from Virtual Earth. But, the Virtual Earth app is actually running within the GE internal browser. If I turn the view in VE to the North, then the view in GE turns to the same view. Pretty cool huh? Before you rush off and try this, make sure you realize some things. To see the Virtual Earth view, look for the "Map Type" menu on the lower left of Globe Glider. To use it with Google Earth: select the "Globe Glider" menu and look for Google Earth (see this image). Once it loads in GE, you should have "Options->General->Use External Browser" turned OFF. Then select the "Open Globe Glider window" option which should now open Virtual Earth in the GE browser window. You can run it with another browser if you want, it just uses more screen real estate. If Virtual Earth 3D doesn't run on your platform (no Mac OS X or Linux, only works on XP SP2 or greater with .Net 2.0+), then obviously it won't work with Globe Glider. I also recommend you have lots of memory and a beefy graphics card if you try to run Google Earth with 3D Buildings and VE 3D with 3D buildings at the same time. It worked for me, but I think I was really pushing my system even with 2 GBytes of memory. Also, there is a problem running Globe Glider with terrain turned on in GE at the moment. Bernhard suggests turning off the terrain layer in GE. I'll write more details after I create the video (probably tomorrow). Bernhard promised me this exclusive since I suggested last year the idea of tying VE Bird's Eye views to the same GE view. By the way, congratulation to Bernhard and the rest of the Globe Glider team. This is really cool stuff if you are geeky enough to be playing around with different virtual globe applications. Great works, not words! This is a peek in the new era of worlds geo-browsing! Many congratulations from all of us at GeoGames! Ooooo, now that is slick.